Velvet Paw Creations: SKELLIE-FEST altered container for Lost Coast Designs! SKELLIE-FEST altered container for Lost Coast Designs! Today is my turn to share some Lost Coast Designs DT inspiration over on our Lost Coaster's Review DT blog. 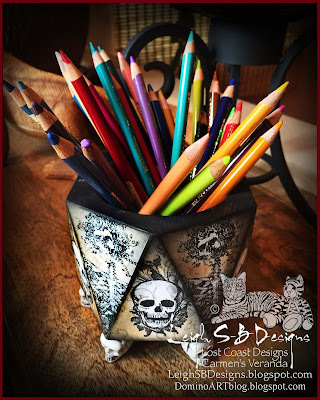 My post is a mini tutorial on how I made my Skull Appreciation Day skellie altered container which was also my Day 1 project for our 2nd annual SKELLIE-FEST event over at Lost Coast Portal to Creativity! Today is the finale but you've still got chance to win our $20 spending spree at Lost Coast Designs and Carmen's Veranda! Just enter your skeleton themed projects in the linky party by midnight PST! You can use any company stamps but you can double your chances if you use Lost Coast Designs or Carmen's Veranda stamps, click HERE for all the details! Skeleton and Roses, Skull Flourish plus the Long Swirl flourish stamp was used to create a subtle background. For more info on how I created my container please pop over to Lost Coaster's Review for my tutorial. I found this unfinished wooden container in the craft section at Target and just loved the triangular sides. The skull feet are from a Halloween decoration, they finished it off nicely don't you think. I love how it turned out! Thanks for stopping by today to see my project and don't forget to enter your skeleton themed projects in our SKELLIE-FEST event by midnight PST tonight! Love this box and your mini tutorial on how I made it!